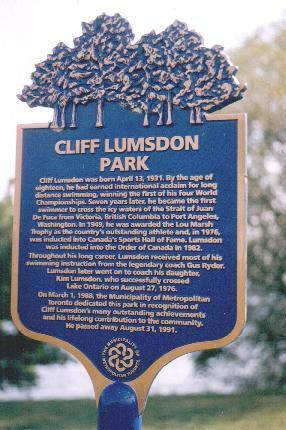 Cliff Lumsdon Park and the plaque are located at the foot of Sixth Street on Lake Shore Drive in Etobicoke (Toronto), Ontario. 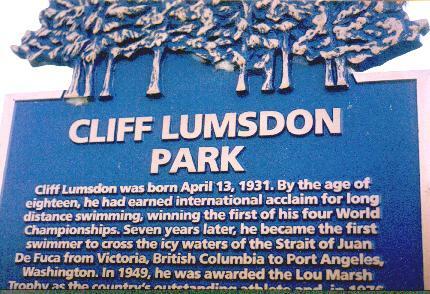 Prior to his death, Cliff Lumsdon and his family lived on Fifth Street. was inducted into the Order of Canada in 1982.
swimming instruction from the legendary coach Gus Ryder. 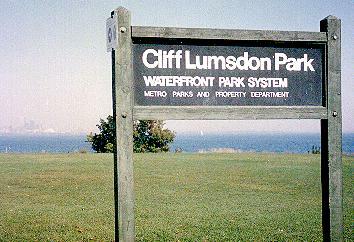 Lake Ontario on August 27, 1976.
and his lifelong contribution to the community. He passed away August 31, 1991.